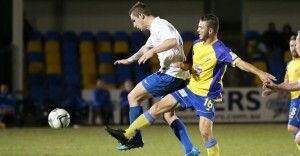 Brisbane Strikers extended SWQ Thunder’s winless league record after cruising to a 6-0 win at Perry Park on Saturday in the Lightning Bolt Derby. Five players etched their names on the scoresheet for the hosts as they dismantled a Thunder side reduced to ten men in the first half following the dismissal of Matthew Hull. Strikers were rarely threatened throughout the contest but spurned early chances as Josh McVey and Trent Clulow both failed to find the target. However, the pair made amends midway through the half as Clulow tucked home McVey’s lay-off to open accounts. The situation worsened for Thunder shortly after when Hull received his marching orders, however the visitors came close to levelling terms just after the half hour when Chris Hewson delivered a free-kick just wide. But Strikers soon made their numerical advantage tell as Greg King fired home on the volley to double the advantage. Thunder goalkeeper Nicholas Andrews then denied a solid strike from Jheison Macuace to ensure the margin remained unchanged at half-time before being forced to leave the contest after the restart with injury. Strikers effectively sealed the points on the hour when Macauce netted his first of the evening after turning in Andy Thompson’s cross from close range. Minutes later, McVey struck the cross-bar for Strikers before Macuace secured his brace after pouncing on a spill from substitute Thunder goalkeeper Jayden Formasa. With just under a quarter hour remaining, the Thunder custodian then repeated his error to gift McVey his first of the night and Strikers their fifth of the evening. In the final minutes Strikers substitute Scot Coulson iced the result after Michael Angus won possession in midfield in the build-up. The results marks two straight wins for Strikers who hold on to second place in the league standings, two points behind first-placed Moreton Bay United. Speaking post-match, Strikers midfielder Angus said match was altered by the sending off and it will have his teammates primed for their mid-week Westfield FFA Cup tie against the league leaders. “I don’t think there’s anything better than a game a few days before hand and I think it was ideal considering the goals that we scored,” he said. Thunder coach Chris Wilkes said his team were unable to cover for Hull’s dismissal following a recent heavy playing schedule. “We knew we were in for a tough game but as soon as the red card was pulled out and having played on Wednesday night for 115 (minutes), it was going to be tough,” he said.